The units were mounted, trimmed out and finished soup-to-nuts in Mickey’s Bloomington plant. Frank Beverage Group prides itself on being a 4th generation family-owned and operated beer, wine and spirits distribution company that has always placed an emphasis on relationships, educating customers, creativity and an overall ease of doing business. Throughout the generations, the Middleton, WI company has continuously inspired new ways of delivering value to its customers and suppliers. The exact same can be said of Mickey Truck Bodies, also a 4th generation family-owned and operated company that has built its 110-year-old business on loyal relationships; creative distribution solutions; outstanding value; and customer-friendly service. It’s no wonder the 2 companies have forged a successful working arrangement rooted in a solid relationship between Mike Parker, General Manager of Mickey’s Midwest Reconditioning/Service Center in Bloomington, IL, and Kyle Nevenhoven, Logistics Manager for Frank Beverage Group. The relationship started with Mickey reconditioning sideloaders for Frank Beer Distributors, Frank’s beer distribution division. But last year, the relationship between the 2 companies took a “new” spin. Mike worked closely with Jim Hiatt, Mickey’s VP Sales for the Van Body team in High Point, NC, to come up with a competitive quote, and with Mickey engineers to meet the customer’s exact specs and even add a few extra features. The quote included transporting the bodies from Mickey’s main manufacturing plant in High Point to Bloomington, where Mike and his team could mount them on new Kenworth chassis supplied by a local dealer. 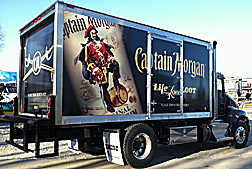 All the finishing work was completed at Mickey’s Midwest Center so that Kyle received 2 new 16-foot units – Captain Morgan and Crown Royal – and an 18-footer – Crown Royal. Continuous communication between the customer, Mickey’s Van Body and Engineering teams, and the Midwest Service Center was the key to success. Mike also brought Kyle together with a local decal supplier and worked with them to create full-size decals for the backs and sides of all 3 units. 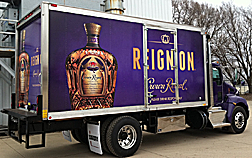 The Crown Royal bodies were painted metallic purple to match the cabs, and the Captain Morgan body was painted black to match its cab. The units were mounted, trimmed out and finished soup-to-nuts in Mickey’s Bloomington plant. “There were a few things we learned in the process since this was a new venture for all of us, but things went well and I’m very happy with the new trucks,” Kyle explains.